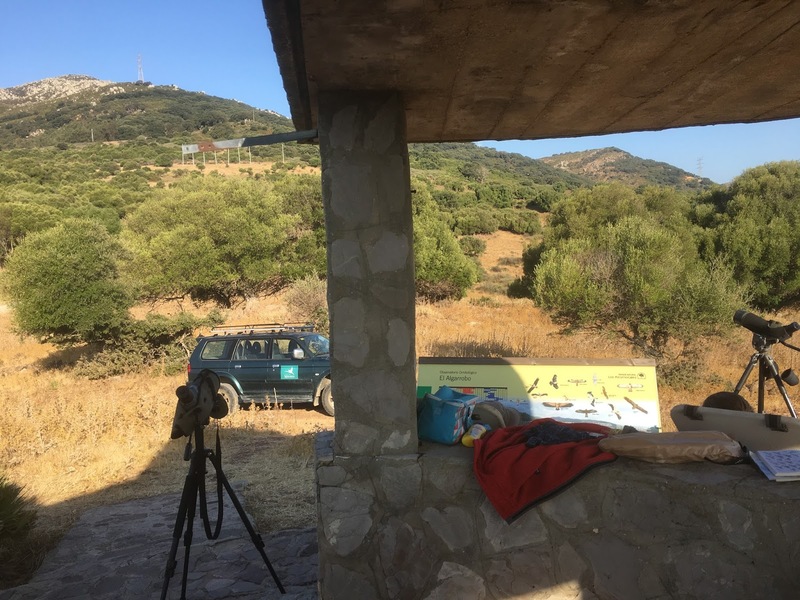 After setting off from Mijas just prior to sunrise I arrived at the El Algarroba watch-point, Tarifa just before 9am, even before the 'Migres' staff had arrived. Before setting up I had a quick scour of the scrub area and it wasn't long before I'd recorded Common Redstart, Spotted Flycatcher, Pied Flycatcher, Chaffinch, Greenfinch and Linnet. A few Common Swift were drifting through and eventually several Red-rumped Swallow passed by along with a few Barn Swallows and House Martin. With most people now preferring the new Cazalla site to watch from I was the only person at Algarroba during my three hour stint, apart from the staff and a couple of locals, so reaped the benefit of some expert spotters. In fact it wasn't long before the first raptors were found, a couple of Black Kite perched up on the pylons. Honey Buzzard - By far the most prolific today! Birds soon began to drift over the mountain tops, mainly at height due to the conditions but several came down low for some exceptional views. When here I'm always amazed at how many Sparrowhawks actually migrate through and today was no exception, with a count of over 40 birds! However, without a doubt the most prolific bird today was the Honey Buzzard, with both adults and juveniles constantly moving through, mostly in batches of between five and ten but one group over towards Gibraltar contained seventeen. A flock of eighteen Black Stork passed through and the Kestrel count included at least two Lesser Kestrel. No Rüppell's Vulture while here, although I did locate one on route down to La Janda but a single Bonelli's Eagle was gratefully pointed out by the staff. Black Kites - Around 30 or so through today! I left the counting to the 'Migres' people, I was here to simply enjoy the spectacle and by the time I departed just after midday my total species list consisted of: Booted Eagle, Short-toed Eagle, Bonelli's Eagle, Common Buzzard, Honey Buzzard, Osprey, Common Kestrel, Lesser Kestrel, Black Stork, Egyptian Vulture, Marsh Harrier and Sparrowhawk! A total of 12 amazing species. Booted Eagle - A hundred or so during my stay! From here I moved around to Cazalla but the place was mobbed, so this was where all the birders were! I didn't bother to stop, the parking was a lottery so I moved further around the coast, finding a nice stop to have my packed lunch. It was here I managed lots more passage birds, including my only Rüppell's Vulture of the day, in amongst a group of Egyptian and also several Alpine Swift were a grateful addition. La Janda next but I'll post that later as I want to include some record shots of my raptor watch! Egyptian Vulture ~ All my photos today on the Canon SX50 bridge camera! Another Booted Eagle moving through!